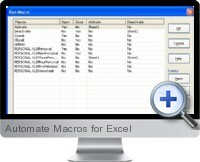 Automate Macros for Excel is a powerful Excel add-in that enables users to easily automate the process of running Excel macros. Automate Macros for Excel provides two methods for automation. One method involves the addition of a user defined function called Run Macro which can be inserted into a worksheet. The Run Macro function works by triggering macros in response to whether a specified condition evaluates to true or false. The second method allows to run macros in response to several workbook and worksheet related events. Automate Macros for Excel enables control of when Excel macros run in an application with no programming involved. Run Macro Function: runs macros based on whether a condition that you specify evaluates to true for false. The condition consists of comparing two values with a comparison operator (e.g. C2 > 9). There are number of different options to choose from for each of the two values including a single cell range, a number value, text value, or a value that is returned from another function. There are also several different comparison operator options to choose from such as ' Begins With' on text based values. There is an option to run one macro if the condition evaluates to true and another macro if the condition evaluates to false. In addition to running macros, it can be specified that the function returns a value depending on whether the condition evaluates to true or false. When the workbook first opens. When a particular sheet is first activated. When a particular sheet is deactivated by clicking on it. More than one macro can be assigned to an event and the same macro to multiple events.